We are Tiny House in My Backyard (THIMBY), an interdisciplinary team of UC Berkeley graduate and undergraduate students who design, prototype, and develop long-term and sustainable models for tiny home communities. Starting by building an award-winning, sustainable tiny house for the 2016 SMUD Tiny House Competition, we are now focusing everything we have learned to use tiny houses as a viable solution for homelessness. Together with organizations like Greater Richmond Interfaith Program (GRIP) and Tent Makers, we are launching the TINY HOUSE BIG IMPACT program to build beautiful, sustainable, and affordable tiny homes for homeless families, while also training people within the homeless community to build tiny houses themselves. Not only will this program provide an immediate housing solution for families that need help now, but it will also continue to positively impact the homeless community as we help train dozens of homeless people in tiny house building. For our Pilot Project, we are building a home for an inspiring mother named Constance, and her two children, Miracle and David, who are in desperate need of a home. Our goal is to raise enough money to buy quality materials for Constance’s tiny house, as well as employ experienced professionals within the homeless community to build and train other homeless individuals in building skills. The first impression meeting Constance, Miracle, and David, is that they are one of the most loving, charismatic, and laughter-filled families imaginable. No one would ever guess they have been homeless, living in and out of shelters for the past 2 years. Constance and her children, David and Miracle, looking forward to turning their bus into a home. After a back injury prevented Constance from working as a bus driver, she could no longer afford the rising Bay Area housing prices, and her family was forced to sleep in cars and shelters. They have been living at a transitional homeless shelter for 6 months, but are already at the end of their permitted time period and desperately need housing. Fortunately, Constance owns a bus from her days as a bus driver, and is adamant about transforming it into her dream home. Constance found THIMBY by working tirelessly with the homeless transition Program GRIP, and she inspired us so much with her story that we knew we had to help her in anyway we could. The responsibilities of the TINY HOUSE BIG IMPACT program will be shared among three groups: THIMBY, GRIP And Tentmakers Nonprofit. Professional Tiny House builder, William Burdock, will be running the construction and carpentry training workshops on a build site allocated by UC Berkeley. During our pilot project, we will be training and teaching several homeless individuals skills they can use to help house themselves and others for the rest of their lives. In exchange for their efforts in building our first project, these volunteers will be the recipients of the next tiny house project we build. 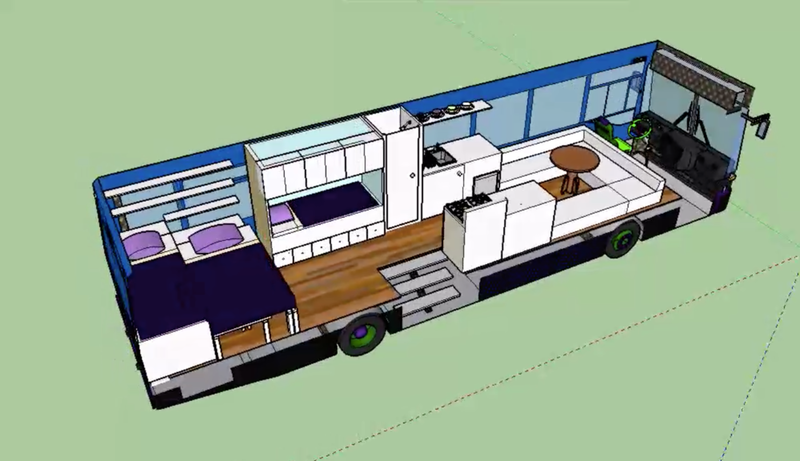 We plan to finish Constance’s Bus by the end of 2018 and continue to build 2-3 more tiny houses in the following year. By 2020, we aim to build up to 5 tiny houses per year, allowing us to create a large impact on the housing and training of many members of the homeless community.